For colored hair. 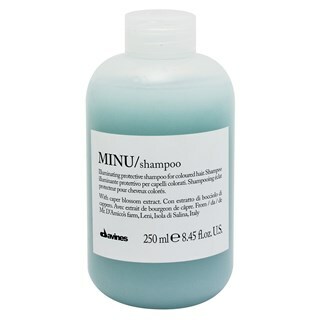 Rich, full-bodied and foamy MINU Shampoo is formulated with caper blossoms to gently cleanse, protect and extend the lifespan of colored hair. Winner of Self Magazine's 2015 Self-Approved Beauty Awards. Salina Capers. Grown on the farm of Mr. Salvatore D’Amico from Leni, Salina Island, Messina, Italy as part of Slow Food Presidium. Salina Capers are good sources of quercetin, a protective amino acid, and color-protecting polyphenols.